﻿ Best Price on Paraiso Cano Hondo in Los Guineos Perdidos + Reviews! With 11 natural pools, free Wi-Fi and parking, and complementary breakfast, the isolated Paraiso Caño Hondo eco-lodge in the Los Haitises National Park offers guests a nature escape. . 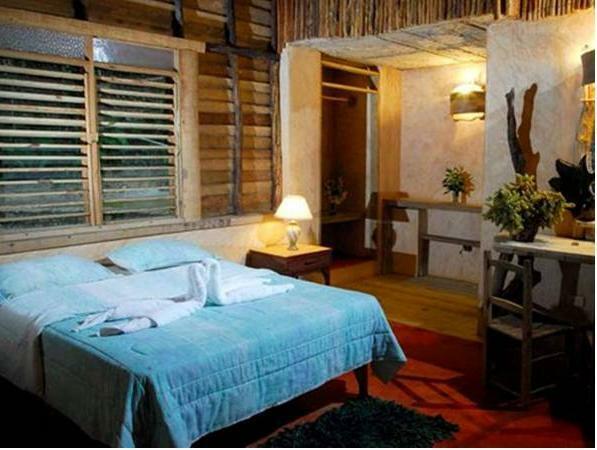 The lodge’s rooms feature wooden floors, a desk and chair and ceiling fans. They also feature a bathroom with a toilet and shower. The lodge’s El Cayuco restaurant and Don Clemente restaurants offer views of the Samana Bay and San Lorenzo Bay and serve traditional Dominican food for breakfast, lunch and dinner. Guests can also enjoy activities such as hiking, horseback riding, canopy, rock climbing and kayaking within the park. Paraiso Caño Hondo is located 5.6 mi from the town of Sabana de la Mar and 99 mi from the nation’s capital of Santo Domingo. Las Américas International Airport is 2 hours and 30 minutes' drive away. The location is really nice and has nice surrounding. It was a nice and relaxing. Surrounded by the national park. And the room is like living in a tree house. Because the room is next to a river. There is a continue of water sound all night. The staff, the proximity to the Haitises National Park and the proximity to the Samana Bay where I was whales and the town of Samana. The stay was good, place is clean and beautiful. I missed not having air-conditioning but I knew this before hand. I had the best time ever.